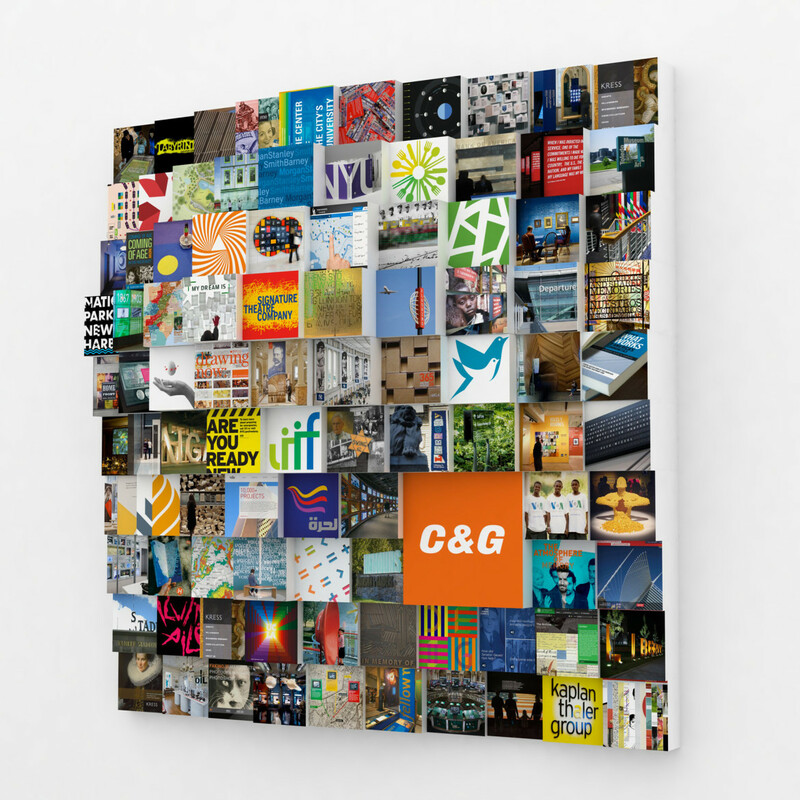 C&G Partners is an award-winning, multi-specialty design studio. With deep expertise in branding, exhibits, infographics, interactives, motion, print, strategy, wayfinding and web, we are uniquely organized to deliver multiple disciplines for the same client. This approach is simpler, more effective and more innovative. 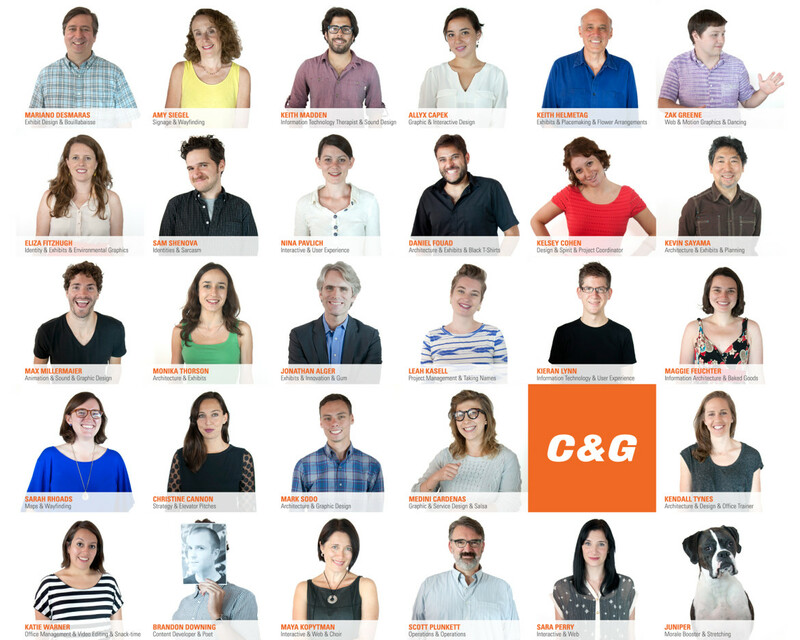 C&G Partners has 30 people. Of those, 4 are studio heads and 6 are managerial. Female, from Bronx, New York, United States, now lives in Chelsea, New York, NY. Formal education is undergraduate degree, primary design education is school (Pratt Institute). I come from a family of artists. (My uncle bought me my first set of paints when I was eight. My grandmother and aunt also painted.) Since I began with painting my earliest influences were painters. The natural world and music have been major influences on my design work, as well as the talented people I have had the pleasure to work with over the years, most recently at Chermayeff & Geismar Inc., and C&G Partners. Age 45, Male, from Bridgewater, Maine, United States, now lives in Park Slope, Brooklyn, New York. Formal education is undergraduate degree, primary design education is school (Yale University). Well, everything, really. My wife. Blogs. Partners. Supportive clients. Things I notice out of the corner of my eye. My children. Listening carefully to people I don't agree with. Friends. My staff. The city. Other designers I've never met. Reading. More reading. Collaborators. Growing up on a farm. Seeing Star Wars in a theater in 1977. More reading. Espresso. My children's friends. My children's teachers. Writing and performing music. The history of wristwatches. Did I mention my wife? My professors. Architects who gave me a chance as a kid. People on the subway. Interns. Projects I didn't get. Old animated series on Netflix. Lego. Past colleagues. Lillet. And ... everything, really. Age 59, Male, from Philadelphia, PA, United States, now lives in Gowanus / Carroll Gardens, Brooklyn, NY. Formal education is graduate degree, primary design education is school (University of California Berkeley). My mother was a devoted guide at the Philadelphia Museum of Art, who traveled worldwide to add to her research for her tours. Seeing this from an early age conveyed the worth of hard work and informed content. My father wrote briefs as a railroad lawyer and restored furniture in our home shop after work, imparting the value and joy of handcraft. Professors allowed me to write studies of my neighborhood buildings, to animate films, to sketch architecture as I pleased, and to undertake lengthy critiques of contemporary placemaking. Chermayeff & Geismar designers introduced me to the design profession over many decades of collaboration. My current partners have helped guide me through my most revered recent and future commissions. Age 30, Male, from Portland, OR, United States, now lives in Dumbo, Brooklyn, NY. Formal education is undergraduate degree, primary design education is school (University of Oregon). A major part of my design education centered around the idea of intermedia – blending mediums and designing experiences to create aesthetic experiences. It's a recurring theme in our work, we design experiences to engage independent of a medium. Age 50, Female, from Jerusalem, Israel, now lives in Park Slope, Brooklyn, NY. Formal education is graduate degree, primary design education is school (Pratt Institute). In 1991 I enrolled in Pratt Institute’s Interactive Multimedia MFA program. We had to write a paper using a piece of software called Hypercard. I'm sure I'm not the only early Mac user that still has a soft spot for its endearing 2-bit display and dithered images along its terrifying, omnipresent bomb icon. Yet, the concept of selecting a word and hyperlinking it to another index card via motion blew my mind at the time, and still does in some ways. I've created more than a hundred interactive experiences in the years since — from CD-ROMs, kiosks, and apps, to websites — but nothing has yet reproduced that initial thrill of seeing that first card gracefully flip over to display another card. The studio is about 4500 square feet. They’ve been there for 8 years. The work week is 40-49 hours/week, core hours are 9:00-6:00, with the first in at 8:00am and the last out at 8:00pm.